June 1, 2017 – The Best CRM blogs have been selected by Feedspot from thousands of the top CRM websites using search and social metrics. 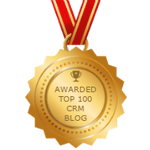 Integros is honored to be among the Top 100 CRM Blogs. Our company publishes CRM news and opinion articles on a regular basis. In our blog, readers can find both technical and business materials on CRM and SugarCRM in particular. Our goal is to make readers well-informed when it comes to CRM, so they can make the most out of their CRM implementations. For this purpose, we also often hold SugarCRM webinars on various hot topics which users usually face in their everyday work. We are grateful to Feedspot, a freemium online RSS feed reader, for including us in the rating, and are planning to further provide our readers with helpful information and expert advice.